How is your food produced? Do you really know where your food comes from? Have you ever been to your local farmer’s market, or do you usually just go straight to the grocery store? More people are becoming aware of the numerous reasons choosing organic food from farmer’s markets is better than conventional food from a grocery store, but most of us don’t realize how far our food travels before we’re even able to see it. Well, according to Worldwatch Institute, the average plate full of food on an American table has traveled 1500 miles before being eaten. 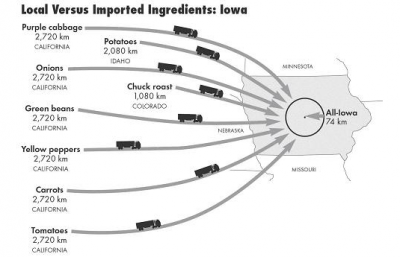 So, what’s the problem with having our food flown across the country, and often imported from across the world, before we actually get to eat it? 1. 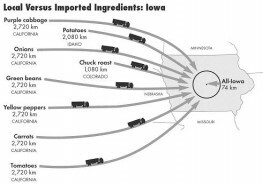 Long distance food transportation consumes large quantities of fossil fuels. CUESA says that it is estimated that we currently put almost 10 kcal of fossil fuel energy into our food system for every 1 kcal of energy we get as food. “We are spending far more energy to get food to the table than the energy we get from eating the food. A head of lettuce grown in the Salinas Valley of California and shipped nearly 3,000 miles to Washington, D.C., requires about 36 times as much fossil fuel energy in transport as it provides in food energy when it arrives,” says Worldwatch Research Associate Brian Halweil. 2. 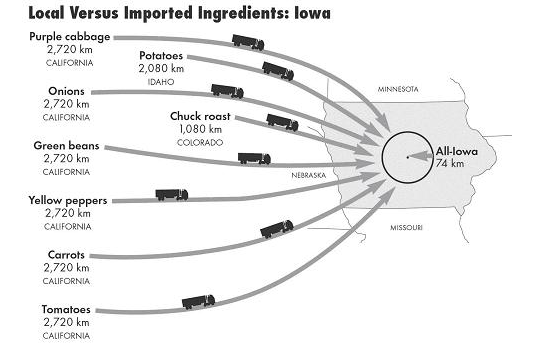 Much of the food shipped from hundreds of miles away needs to be picked while unripe then gassed to “ripen” after transport, is highly factory-processed with preservatives, and is irradiated. Further, scientists are trying to genetically modify our food so that it can last even longer. Do we really want that? 3. It is believed that long-distance food trade is beneficial because everyone can buy at lowest-cost provider, but farm communities benefit very little and often suffer as a result of freer trade in agricultural goods. 4. Locally grown, fresh food actually tastes like real food. Food grown locally is harvested when ripe and doesn’t have to be fumigated, refrigerated, or packaged for long-distance traveling or altered for long shelf-life. Unlike foods that travel long distances- fresh food isn’t artificially ripened.